I know we’re only in October, but it’s just over ten weeks until Christmas. I’ve started looking for present ideas which feel fun and a bit unusual, and the new Unicorn Milk Gift Set from Being by Sanctuary seriously fits the bill! Coming packaged in an uber-cute reusable tumbler, the Unicorn Milk Gift Set has everything you need popped in it to enjoy a chilled evening in. For an uber luxe shower experience, there’s a shower pouf as well as a tube of Cloudberry & Lychee Blossom Body Wash. Fresh and delicately fruity, it’s a perfect morning pick-me-up which leaves skin delicately fragranced all day. There are post-shower treats too, in the form of Cloudberry & Lychee Blossom Body Lotion and Body Mist. Now that the weather is getting a whole lot cooler, I’m making sure to moisturise each morning to keep skin looking and feeling healthy, and I’m loving the soft fruity scent of the line. The Body Mist is a great option to stay smelling good all day too! It’s great for casual days when I’m running errands or popping to the gym – it’s portable size is perfect for popping into a handbag, or for travel too! 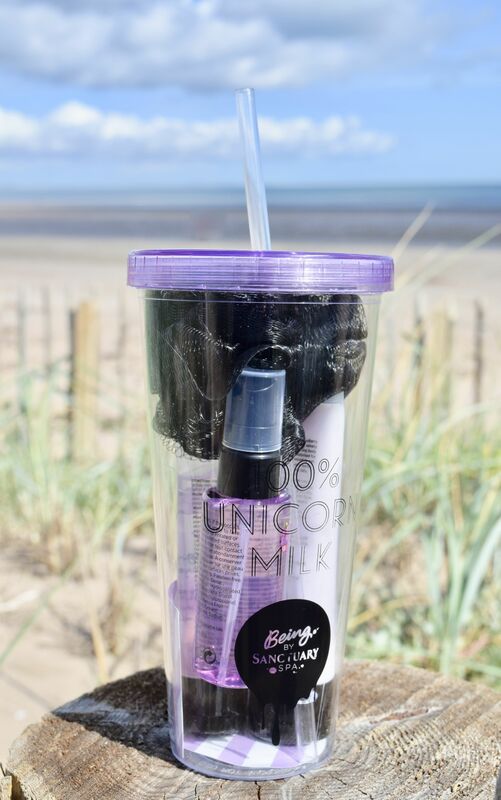 Being by Sanctuary Unicorn Milk Gift Set is priced at £15 and is available here.